The 2014 bull test has 16 bulls from 10 farms are consigned. Gains, BCS were tracked. 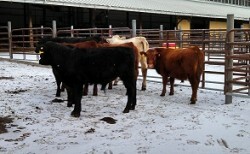 Breeding soundness exams and carcass ultrasound were performed at the conclusion. More information will be forthcoming.